Brian's passion for Rehabilitative Qigong & Tai Chi was first conceived in 2005 after an accident left him with bilateral shoulder separations, which traditional physical therapy methods failed to improve. Motivated to find a better way, he committed himself to the only physical exercise he could comfortably do, Qigong. This gentle, yet powerful practice of painless movement, visual focus, coordinated breathing, and mindful muscle engagement yielded surprisingly rapid results in range of motion, strength, and function. Deeply impressed by the experience, Brian began discovering the connections between the ancient practice of Qigong and Tai Chi and the findings of modern neuroscience. Rehabilitative Qigong and Tai Chi has allowed us to explain the healing properties of this ancient wisdom in a language that the western world can understand. Rehabilitative Qigong & Tai Chi weaves research based bodymind science with the principles of the ancient arts. By combining slow, fluid movements with coordinated breathing, visual tracking, and mindful intent, Rehabilitative Qigong & Tai Chi enhances the body’s natural healing capabilities and effectively treats pain syndromes and specific conditions of physical and psychosocial dysfunction. Traditional Physical Therapy addresses the body with strengthening, stretching, and balance exercises. A consistent regimen of solely physical exercise will have positive effects on the body, but modern research and practice has shown that activities that relax and focus the mind in conjunction with a physical treatment regimen are much more profound. Bodymind practices like Tai Chi & Qigong have been shown to elicit activity in the “healing” branch of the nervous system turning on natural anabolic resources such as stimulating the immune system, enhancing metabolism, and decreasing pain perceptions. Rehabilitative Qigong & Tai Chi blend specific movements designed to stretch, strengthen, and re-balance injured or painful body regions with focused breathing and enhanced body awareness combining common sense and intuitive body wisdom. As a Qigong and Tai Chi teacher, many of your students will find you because they are struggling with their health and bodies. How can you best help those with rehabilitative needs when you don't have a background in medicine? Feel confident, gain credibility, increase your knowledge and skills and dramatically improve your ability to help students suffering with pain and disability with the Fundamentals of Rehabilitative Qigong and Tai Chi Certification through the Institute for Rehabilitative Qigong & Tai Chi (www.IRQTC.org). And how is it useful? In general, Rehabilitative Qigong & Tai Chi focuses primarily on coordinating natural abdominal breathing with specific therapeutic movements, however at times reverse abdominal breathing can be very effective with accomplishing certain goals. The first Tai Chi masters were keen observers of nature and supposedly watched infants to learn about natural, inherent breathing processes. There are basically three types of natural breathing processes: abdominal breathing, reverse abdominal breathing, and stress (upside down) breathing. Stress breathing occurs when we feel threatened and results in high, heaving chest expansion during inhalation. When upset, children use this breathing method to project vocalizations and release powerful emotions. In adults, while this breath style is a natural survival process when running from an angry dog, prolonged, it quickly loses its advantage and becomes physiologically costly. Unfortunately lower level stress breathing is also very common in adult populations and a major contributor to most disease processes. Abdominal breathing is typically seen when a child is safely asleep and noticeable by abdominal expansion during inhalation. Focused, relaxed abdominal breathing has been shown to prompt a parasympathetic nervous system shift and activate natural healing responses in the body. Most Qigong & Tai Chi gestures coordinate abdominal breathing with movement to, among other things, improve blood flow and lymph circulation. During reverse abdominal breathing the abdominal and pelvic floor muscles contract during inhalation causing the breath to expand towards the lower back or up into the solar plexus areas. This breathing pattern would naturally be seen when a child braces her core muscles while pulling herself to stand. According to Kenneth Cohen in “The Way of Qigong”, traditional Chen style Tai Chi martial artists use a rapid exhalation with reverse breathing to simultaneously increase striking power and also sink “qi” downward to improve balance and stability. Cohen goes on to say that, “reverse breathing is generally dangerous for physical and mental health, except under certain conditions or as a specialized Qigong exercise.” In contrast to Cohen’s opinion, Yang Yang Ph.D. notes that reverse breathing, “is a deeper, more efficient way of breathing and therefore obviously beneficial to health and respiratory function.” It is worth noting that varied views with regards to breath practices are common and even healthy, reminding us to discover for ourselves what is useful. "At the IRQTC, we believe in reconnecting the healing arts with physical rehabilitation. The old notion of the body as a machine is fading away as modern scientific research continues to reveal that the bodymind is integrated, intelligent, and vital. Ancient wisdom practices like Qigong & Tai Chi have developed time tested systems of self-care in line with this understanding over thousands of years. 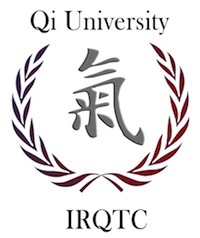 The IRQTC is dedicated to the scientific application of Qigong & Tai Chi practices as primary treatment modalities in leading edge physical rehabilitation." Brian Trzaskos, Founder and Director. A Rehabilitative Qigong and Tai Chi session includes a complete client evaluation and development of an individualized program focusing on each client’s individual needs. The powerful practices of Qigong and Tai Chi will teach clients to integrate healing movements, deep breathing, meditation, and self-massage into an effective and inexpensive home healing program. Rehabilitative Qigong and Tai Chi sessions may include additional manual techniques such as CranialSacral or Myofascial therapies to enhance treatment effectiveness and optimize each client’s physical and emotional life. We recognize that traveling a distance can be a barrier for some, so we arrange remote consultations via Skype and Face Time for out of area clients. These sessions include distance evaluations and customized Rehabilitative Qigong and Tai Chi programs that are private and easily accessible to clients. In the acute phase of the RQTC for Neck & Shoulder Dysfunction program we focus on both agonist inhibition and specific muscle recruitment in simple, pain-free movements. Many traditional rehabilitative strengthening programs stall here, in that they continue to work on specific muscle isolation while adding increasing amounts of resistance. Undoubtedly this approach improves isolated muscle strength, however, it doesn’t necessarily translate to agonist/antagonist coordination and functional abilities. Studies indicate that functional based strengthening programs may result in longer term strength gains than traditional, muscle specific exercise programs. In the Rehabilitative Qigong & Tai Chi paradigm isolated muscle re-education and motor recruitment are important early steps to restoring optimal function. Advancing to the subacute and chronic phases of the Neck & Shoulder program bring enhanced focus on both integrating foundational agonist/antagonist relationships and progressing muscle resistance in functional patterns. I was happy to see that a recent MEDBRIDGE article focused on treating scapular dyskinesis with evidence based muscle strengthening and included isolated movement patterns that are incorporated throughout all phases of the RQTC Neck & Shoulder program. In traditional Tai Chi practice there is a saying that, “Qi follows Yi”; essentially meaning that energy follows intention. Qigong and Tai Chi practices are rich with imagery and in the case of Tai Chi focused on martial applications. Surprisingly, when students struggling with learning a new Tai Chi movement are shown the martial application they more quickly synthesize and accurately perform the gesture. Just as with sports like golf and baseball where simply intending to hit the ball in a certain direction directs accurate muscle recruitment, visualizing the purpose and execution of a Tai Chi movement tends to engender more efficient agonist/antagonist patterns. Recounting an earlier mention of the body’s tendency to create complex compensatory patterns, we often attempt to correct these patterns through piecemeal recruitment of specific muscles with little change in the over all dysfunctional pattern. Rehabilitative Qigong & Tai Chi gives us the opportunity to release the linear, rational mind, build on foundation strength, and visualize/intend gestures that result in more efficient, integrated patterns of movement. Qigong is actually comprised of four baskets of practice: movement, breathing, meditation, and self-massage. While the first three baskets seem to get lots of attention, self-massage has more than earned the right to stand in line with its peers. One of my personal favorite self-massage techniques is tapping. The skin is the connecting medium between our physical selves and the external environment. Filled with sensitive and complex receiving devices, the skin functionally acts as the outer covering of the brain and in fact they both arise from the same embryological layer, the ectoderm. Tapping and self-massage have the profound capacity to influence our central nervous system towards homeostasis. The lymph system is the body’s primary detoxification system and one of the most important components of any Qigong practice (including Tai Chi). Lymph is circulated through the body in a combination of four ways: gravity, muscle contraction, smooth vessel wall elasticity, and abdominal breathing; which is subdivided further in aerobic and mechanical propulsion. Considering all of these methods individually, abdominal breathing is the greatest contributor to improving lymph flow. Active Qigong practices combine all four primary methods of lymph circulation. Many gestures dip the upper body to or below waist level, lift the arms overhead, and kick with the legs using gravity to propel lymph through the system. Alternating muscle contraction and relaxation phases necessary for Qigong movement pump lymph as well. Along with aerobic and mechanical propulsion, abdominal breathing elicits a parasympathetic shift resulting in vasodilation and facilitation of smooth vessel wall elasticity. ESSEX — When Brian Trzaskos suffered bilateral shoulder separations about eight years ago, he found himself unable to recover using traditional physical-therapy methods. “When the stuff I was taught in school wasn’t working, I fell back on my qigong and tai chi practices,” said the physical therapist of 21 years. Trzaskos, who is also licensed in massage therapy and certified in tai chi, qigong and meditation instruction, made strides in his recovery with the ancient Chinese exercises and decided they would be valuable to his clients, as well. So six years ago, after having worked at Craig Hospital for spinal cord and brain injuries in Englewood, Colo., as well as Elizabethtown Community Hospital, the SUNY Buffalo graduate opened his own practice. Ascent Wellness, located within NEW Health at 2885 Essex Road in Essex, offers physical, occupational and massage therapy based on clients’ needs, not on their diagnoses. “We’re very specifically oriented to the clients’ needs,” Trzaskos said. Because his practice doesn’t deal with insurance companies, he noted, it is able to raise the bar on the quality of care it provides and have a “healing relationship” with clients that addresses their needs without being limited by a third-party payer. In addition to offering traditional manual therapy, including joint manipulation — soft-tissue-release, muscle-energy, deep-tissue and craniosacral techniques — and neuromuscular therapy, Ascent Wellness designs personalized programs for clients that incorporate tai chi and qigong as therapeutic tools to rehabilitate the body.